Boondocking around Quartzsite on land managed by the Bureau of Land Management (BLM) and called Long Term Visitor Areas (LTVA) is an easy and effective introduction to desert boondocking and snowbirding. Support services and supplies are plentiful, and the great gathering of veteran boondockers, much like the mountain man rendezvous of 150-200 years ago, stand ready to help out if needed. But once you’ve perfected your boondocking skills, plenty more snowbird/boondocking possibilities exist outside the LTVAs of Quartzsite in the Mojave Desert of Southeastern California (including some LTVAs in California, just west of Yuma) and the Sonora Desert of Southwestern Arizona. After trying an LTVA you might want to try out some lesser-known snowbirding opportunities. You will find the main mid-winter snowbirding locations clustered about the lowest elevations: around Yuma on both sides of the Colorado River, in California west along the Mexican border, up the Colorado River including the Parker Strip and around Lake Havasu, east toward Phoenix and down to Tucson. 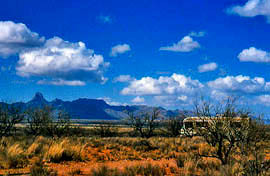 Low-elevation desert camping is also available around Deming in New Mexico. The rest of New Mexico is higher elevation, over 2,000 feet, and therefore colder, as are the northern and southeastern parts of Arizona, though many snowbirds gather around Benson and Willcox. To make your job of finding dispersed boondocking campsites easier, visit one of the regional offices of the BLM, where they can provide you with both designated and undesignated camping areas. You may find the designated camping areas buzzing with ATVs, especially on weekends, and decide to try elsewhere. You can camp anywhere on BLM land where you have access to an appropriate campsite. The access roads, mostly of mixed hard sand and rock, vary in their condition and are not regularly repaired or graded. But wherever you are not blocking a road, and where you are not expressly prohibited from camping by signs or fences, go ahead and stake your claim. 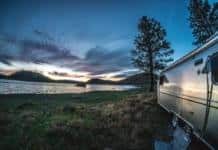 I suggest that you at first pick one of the boondocking areas where other boondockers are present, as this will tell you that conditions like access roads and a hard and level parking surface are available. Though these locations tend to be more crowded, you may find a nice quiet spot and you may feel more secure with others around. When your confidence – or the noise level from ATVs and generators – rises, then go seeking your own back road and explore for your secret boondocking spot. You will find dirt roads heading off into the desert almost anywhere you are driving. And if you look close enough you may spot an RV or two sitting out there in the distance under a mesquite tree. Also, ask your neighbors and other RVers where they have found good quiet and uncrowded spots. They may even tell you. You can find Bob Difley’s RVing e-books on Amazon Kindle. Southwest camping for 85 cents a day!